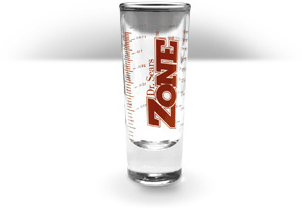 Why do I need a Zone Shot Glass? OmegaRx 2 liquid fish oil can be tricky to measure, especially if you are mixing it with other liquid supplements. We’ve made it simple. Dr. Sears’ Zone Fish Oil Shot Glass is perfect for taking Zone liquid fish oils. It ensures accurate measurements when you use the milliliter gradient marks, where 5 ml equals about one teaspoon. It’s also perfect for measuring a Zone Cocktail, where you mix a teaspoon of Zone liquid fish oil and an ounce of SeaHealth Plus. The combination of these two active ingredients is a nutritional, anti-inflammatory powerhouse, with an excellent taste. I very much like Dr. Sear’s fish oil measuring shot glass. First I measure the fish oil into the shot glass and pour it from there into a large spoon. Works for me! Mix some oj with fish oil and my 9 year old takes no problem! Shot glass makes it so easy to take the OmegaRX2. We love it! The perfect size for taking my fish oil and measuring it out easily – leaving it on the counter reminds me to take my daily dose.